Test Information, As It Happens, From All Your Sites Around The World! In the twenty first century, competitive producers of complex electronics need to understand everything about their manufacturing operations around world. Control must be exerted. Problems must be anticipated and addressed before they get out of hand. How well you use test information will determine how well you compete! 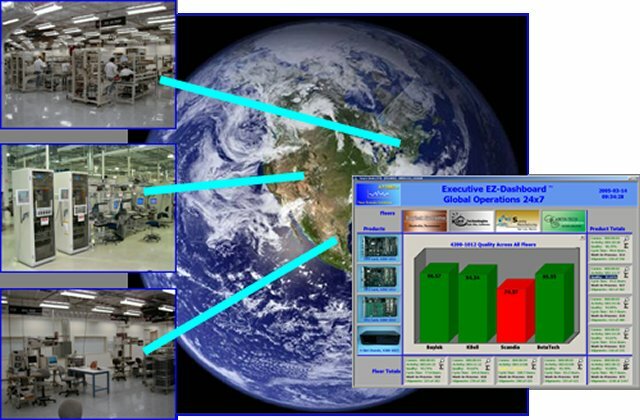 Anagon test solutions (above left), in your various locations around the world, automatically execute, record, and store hundreds of electronic measurements for every unit produced. As measurements accumulate, Anagon software continuously analyzes and transforms them into updated test information. This information is delivered 24/7 from each of your sites directly to your desktop, laptop, or conference room wall where it is summarized in dashboard form (above right and below). If It's Anagon, It's Automatic! Throughout the years, Manufacturing and Quality organizations have tried to adopt best practices using: "Continuous Improvement", "Cpk"; "ISO9000", "TQM", "Six Sigma", ... the list goes on. Their underlying principles make sense. But in the end, it's not about principles or training; it's about day to day execution. Anagon has practical test information systems that help people execute every day! Our Executive EZ Dashboard™ is our newest breakthrough technology! 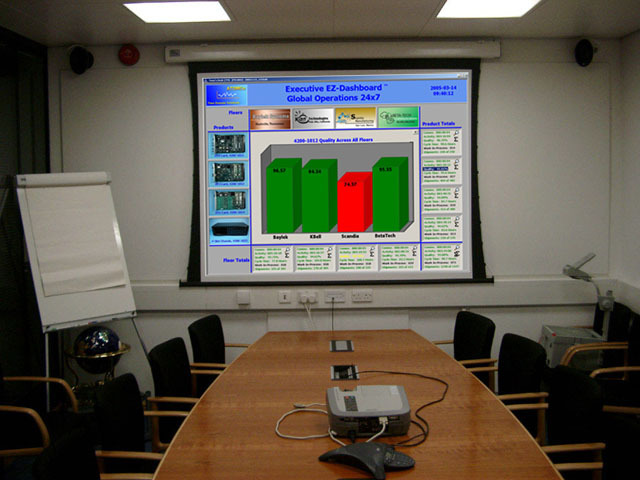 Every day, at any time, you can glance at the main board and have a complete picture of where your operations stand. Everybody shares the same data. Controlling your contract manufacturer(s) has never been easier! You don't even have to leave your office! For complex electronics manufacturing, it's all about electronic measurements! Anagon has many years of experience working closely with clients on various manufacturing floors. We understand the structure of test information and how it is best extracted from test equipment. We know how to record, store, and deliver test information to the people in the organization that need it most.